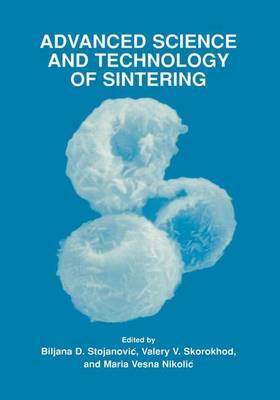 This volume entitled Advanced Science and Technology of Sintering, contains the edited Proceedings of the Ninth World Round Table Conference on Sintering (IX WRTCS), held in Belgrade, Yugoslavia, September 1-4 1998. The gathering was one in a series of World Round Table Conferences on Sintering organised every four years by the Serbian Academy of Sciences and Arts (SASA) and the International Institute for the Science of Sintering (IISS). The World Round Table Conferences on Sintering have been traditionally held in Yugoslavia. The first meeting was organised in Herceg Novi in 1969 and since then they have regularly gathered the scientific elite in the science of sintering. It is not by chance that, at these conferences, G. C. Kuczynski, G. V. Samsonov, R. Coble, Ya. E. Geguzin and other great names in this branch of science presented their latest results making great qualitative leaps in the its development. Belgrade hosted this conference for the first time. It was chosen as a reminder that 30 years ago it was the place where the International Team for Sintering was formed, further growing into the International Institute for the Science of Sintering. The IX WRTCS lasted four days. It included 156 participants from 17 countries who presented the results of their theoretical and experimental research in 130 papers in the form of plenary lectures, oral presentations and poster sections.